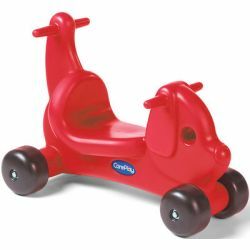 These ride-ons are designed with handles on the “tails” to enable toddlers to push them as easily as they ride them. The one-piece, molded body means that there are no pieces to break off and even the harshest weather won't cause damage. We've even recessed the hubs on the wheels so they can't poke or scratch young riders. The heavy-duty axles and wheels can hold up to 200 pounds. Fully assembled. 10 year warranty. 23"L x 17 1⁄2"W x 13"H.